The Glengarry News, October 1st, 1959, pg. 1, col. 7. Author of Glengarry School Days", "The Man From Glengarry" and other novels with a Glengarry background, Rev. Charles William Gordon (Ralph Connor) will be memorialized at his birthplace, St. Elmo, where a plaque will be unveiled next Saturday afternoon, October 10th. Coming here to officiate at the unveiling is the late Rev. C. W. Gordon's son, King Gordon, now on the staff of the United Nations in New York City. Mr. Gordon's sister is also expected to be here, Miss Lois Gordon of Ottawa, as well as his son, Charles W. Gordon, a student at Queen's University. The plaque is being erected by the Ontario Archaeological and Historic Sites Board and arrangements are in charge of the Glengarry Historical Society. Ralph Connor Rev. Charles William Gordon was born September 13th, 1860, at St. Elmo, a son of the Rev. Daniel Gordon a Highlander who came to Canada as a Presbyterian minister in the 1840s, and his wife, Mary Robertson. Educated at the University of Toronto (B.A. 1883), Knox College and the University of Edinburgh, he began missionary work near Cartwright, Man, while still a student. He was ordained in 1890 and served as a missionary to the miners and lumbermen of the Northwest Territories. In 1804, he was called to St. Stephen's Church, Winnipeg, of which he remained pastor until his death, October 31st,1937. In 1899, he married Helen Skinner King, daughter of the principal of Manitoba College, They had one son, King and six daughters. In World War 1, Gordon became a senior chaplain to the Canadian forces in England and on the Western front and was mentioned in dispatches. In 1920 he was appointed chairman, Manitoba Council of Industry. In 1921, at the time of the church-union controversy, he was Moderator of the Presbyterian General Assembly. He toured Canada speaking in favor of union. Gordon's literary work won him immense popularity and a large fortune that he subsequently lost. The name of"Connor" under which his 30 novels appeared was composed of the first three letters of "Canada" and North", misread by his first editor. 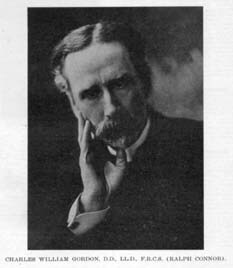 The Sky Pilot (1899), The Man From Glengarry, (1901), and Glengarry School Days, (1902), are the most famous of his novels. The sale of his books exceeded 3,000,000 copies.